This statue has both an impressive presence and a fascinating history. Its consecration contents, which were extracted and studied during its former ownership, comprised a small eleventh-century image of Vairocana, also now in the Ashmolean's collection (cat. 40), as well as numerous tsa tsa offerings and a quantity of sawdust which has been radiocarbon-dated to 1420 +/-45 years. It is likely however that the statue had been reconsecrated at that time, and the original casting of the statue and base was earlier . The elegant simplicity of its figural form, the non-gilt alloy, and the broad lotus petal base all suggest a casting in the twelfth to thirteenth century in the western Himalaya . Further indications of this regional provenance are the tsa tsa , whose mandorla and nimbus recall those of the Ashmolean's Maitreya image in wood (cat. 4 4) , as well as a circa tenth-century rock sculpture of Avalokitesvara at Mulbek in Ladakh . The twelfth-century clay Buddhas sculpted at Lhalung monastery near Tabo share very similar features such as the distinctive ears far from the head, large eyes with curving upper eyelid, and the drop-shaped urna . 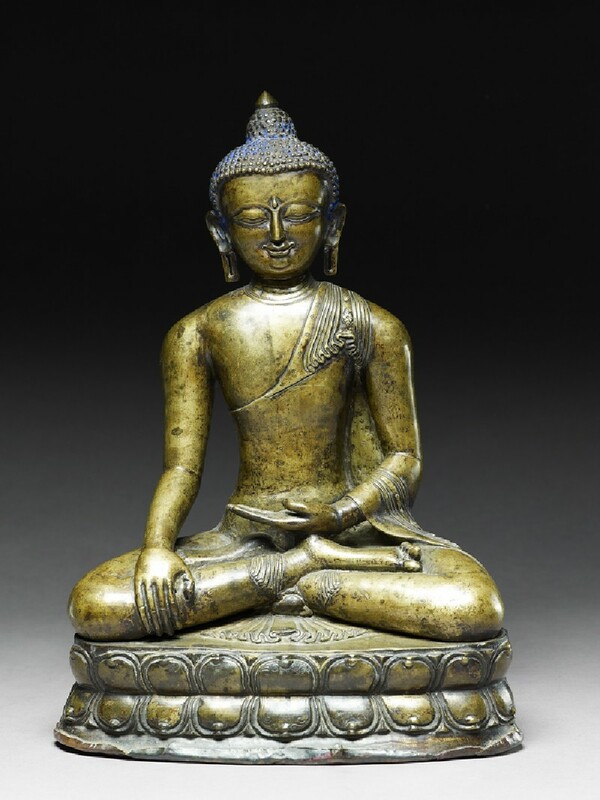 In a technical study, the alloy has been analysed and identified in a group of sculptures attributed to West Tibet, eleventh-thirteenth century . Despite the lack of inscriptional evidence, these factors firmly support the dating and attribution to western Tibet. Sakyamuni is represented here in the classic earth-touching gesture, at the moment of his triumph over Mara just before his Enlightenment. The head is rounded and the face has a very broad forehead, with the hairline slightly over-wide above the temples. This feature, combined with the round jaw, gives a slight heart-shape to the face. The chin is also rounded, with a slight double chin. The face is not angled but quite straight in alignment. The ushnisha is domed with a jewel finial, the jewel quite clearly defined. Blue pigment is applied throughout the curls of hair, which are bead-like and smoothly rounded, with no swirl modelling or incised detail. The ears are fully formed, with a clear lobe edge inside the extended earlobe, as if forming an earring, but in fact clearly one of the supernatural physical signs of the Buddha. The folds of skin inside the ear are very realistically represented. The ears extend slightly away from the head. The drop-shaped urna is in relief. The eyebrows arch and join above the narrow nose, with a slight Roman tip and very thin nostrils. The eyes have the usual dip in the upper lid, and there is no incised indication of the pupil, nor any sign of inlay. The cheekbones are not apparent, but the face does not seem chubby. Both lips have a pronounced bow shape. The lower lip has a dip and cavity on the upper surface which gives the impression of a slightly open mouth. The lips retain traces of red pigment. The neck is short, with three folds of skin as in the Bodhgaya Buddha type . The shoulders are broad but the arms are still quite slender. The fingers are elongated and slender, with clearly delineated articulations, and both hands have the topmost joint of the thumb inclined towards the palm. The fingernails are also carefully defined, as are the toes and toenails: the arch of the foot is marked, the upper joint of the second toe is raised and arched, and the smaller toes also follow this position. The big toe is not raised but lies flat on the thigh. The samghati (robe) has a very distinctive draping. The upper corner is draped over the left shoulder (but is not fully modelled at the rear, making it hard to tell how the robe was actually draped). A cluster of fabric emerges from behind the left shoulder, forming swallow-tail pleats with a central panel that has two different decorative motifs in relief, both in a diamond shape . The edge of the robe has another design, a very small floral print, as if punched or imprinted into the metal. These floral patterns are imprinted sporadically throughout the robe and are particularly visible on the edge of the shoulder folds. The diminutive florets are also visible on the midriff of the robe, on the thighs, and continuing down to the ankle pleats. The pleats appear again on the lower section of the sleeve of the robe, which seems a misrepresentation of the drapery of the cloth, and the same diamond motif appears in the centre panel of the pleats. The edge of the sleeve again has the floret pattern decoration. The lotus cushion has two layers of lotus petals on the upper and lower level; the petals are broad, with some very faint incised carving visible on a few, though not all. There is no beading on the edges of the lotus pedestal. The statue was sealed with a copper plaque, the edges of which are just visible on the lower level of the lotus pedestal. The lotus pedestal has two lateral lugs to retain the statue in place, thus the pedestal and statue were separately cast. There are two slots into which the torana or prabha (now missing) would have been positioned, and a lug to retain it. At the centre of the back there is a vertically positioned rectangle and, above this, a further retaining slot for the torana. With its subtle refinement and elegant simplicity, this image of Sakyamuni admirably demonstrates the sophistication of artistic sensibility developed in western Tibet and Ladakh between the eleventh and thirteenth centuries. 1 See Reedy, 'A Buddha within a Buddha', passim. 2 This sculpture was previously published by Klimburg-Salter, Silk Route and Diamond Path, pl. 82, and there attributed to the western Himalayas, perhaps Ladakh, 12th-13th century, based on a comparison with the murals of the Lha khang Soma at Alchi and a thirteenth-century thangka from Spiti. 3 Reedy, op. cit., pp. 100-1, for photographs of the tsa tsa of Padmasambhava, Santirakshita, Ushnishavijaya, White Tara, and Vajradhara. 4 See cat. 44 above for references. 5 Luczanits, Buddhist Sculpture in Clay, figs. 100-1 and 108, pp. 89-106. 6 Reedy, Himalayan Bronzes, no. W141, pp. 82-83, for discussion of the differentiation of the composition of alloys and their relation to the geographic provenance of the sculptures studied. 7 See Woodward, 'The Indian roots of the "Burmese Life of the Buddha" plaques'. 8 The distinctive shape of the shoulder pleats and the pleats of the robe between the legs is seen in the shoulders of the clay sculpture of Lhalung, illus. in Luczanits, op. cit., fig. 93. These pleats may be observed in several metal sculptures attributed to west Tibet, such as Reedy, op. cit., W140: Tathagata Akshobhya. Reedy has attributed K73, Buddha Sakyamuni, to Kashmir, tenth century, analysed as brass, while the same statue was attributed by Klimburg-Salter, op. cit., pl. 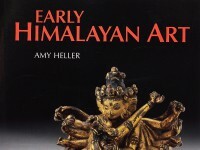 81, to western Himalayas, 10th-11th century.